Not many vehicles can pull off being tough and well-mannered at the same time. But Lexus has been doing this for a while now, and the 2013 Lexus GX 460 is its latest sport-utility vehicle that manages to be supremely talented in both areas. Blessed with the proven on- and off-road DNA of its Toyota 4Runner and Land Cruiser cousins, the GX 460 is as adept at providing a smooth, quiet highway ride as it is nimbly working its way through a rugged, rock-strewn trail. This Lexus owes its well-rounded nature to the capable hardware that lives beneath its polished wood, thick carpeting and soft leather. Not only does the GX have an adaptive suspension (with three driver-selectable modes) but it also sports adaptive stabilizer bars. The latter perform their expected duty of minimizing body lean when rounding corners, but they can also be disengaged off-road to allow maximum suspension travel. Crawl Control endows the GX 460 with even more off-road prowess. This feature automatically modulates throttle and braking to maintain a selectable speed and optimum control whether ascending or descending a hill. Packing all that hardware does lead to some considerable heft; the GX weighs north of 5,000 pounds. Fortunately, it's ably handled by a smooth 4.6-liter V8 that provides ample performance and enough grunt to tow up to 6,500 pounds when properly equipped. Still, if you don't need a vehicle with the GX 460's considerable off-road talents, there are likely better choices. Luxury crossovers such as the Acura MDX, BMW X5 and Mercedes-Benz M-Class offer more passenger comfort along with slightly better fuel efficiency. You might consider the Land Rover LR4 given its similar on- and off-road talents, although the Land Rover can't match the Lexus' reputation for reliability. But for an all-purpose family mover that's as comfortable taking the boss to lunch in the city as it is schlepping your mountain-biking buddies to the trailhead, the 2013 Lexus GX 460 is an excellent choice. The 2013 Lexus GX 460 is a seven-passenger luxury SUV offered in base and Premium trim levels. Standard features on the base GX 460 include 18-inch alloy wheels, heated side mirrors, rain-sensing wipers, running boards, a sunroof, leather upholstery, a leather-wrapped power tilt-and-telescoping steering wheel, eight-way power-adjustable heated/ventilated front seats (with power lumbar), driver memory settings, power-folding third-row seats, dual-zone automatic climate control and an auto-dimming rearview mirror. Also standard are a back-up camera and a nine-speaker audio system with a six-CD changer, Bluetooth audio and phone, satellite radio, iPod connectivity and an auxiliary audio jack. The GX 460 Premium adds adaptive variable suspension (with rear adjustable height control), auto-dimming sideview mirrors, adaptive xenon headlights, upgraded leather upholstery, a heated wood-trimmed steering wheel, heated second-row seats and rear air-conditioning. Most of these features are available as options on the base model. Other options include front and rear parking sensors, wide front and sideview cameras, power-folding exterior mirrors, a navigation system, a rear-seat entertainment system with twin screens and a 17-speaker Mark Levinson surround-sound audio system. The Premium trim is also eligible for adaptive cruise control, the Crawl Control off-road system, a lane-departure warning system and a driver-attention monitor. 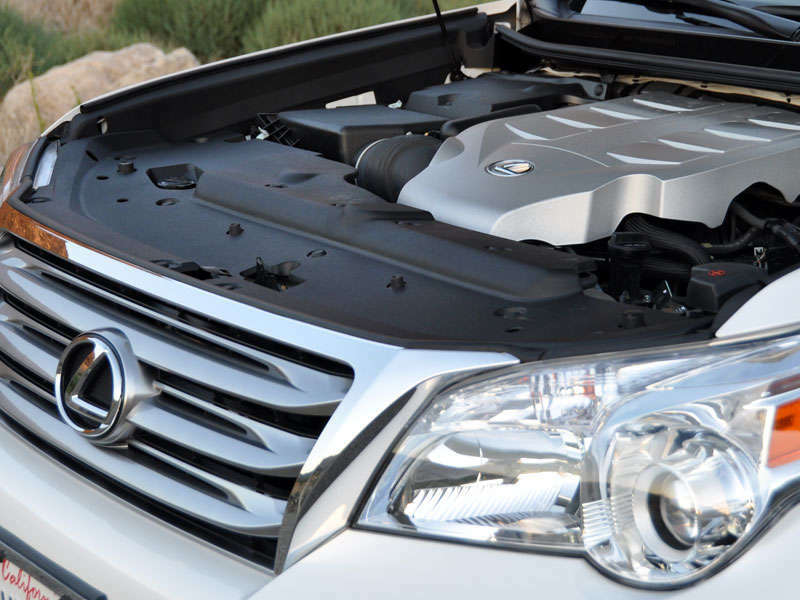 The 2013 Lexus GX 460 is powered by a 4.6-liter V8 producing 301 horsepower and 329 pound-feet of torque. A six-speed automatic transmission -- the only available gearbox -- routes power to all four wheels via a dual-range transfer case. Properly equipped, the GX 460 can tow up to 6,500 pounds. In Edmunds testing, the GX 460 accelerated from zero to 60 mph in 7.2 seconds, an average time for a V8-equipped luxury SUV. EPA fuel ratings come in at 15 mpg city/20 mpg highway and 17 mpg in combined driving. The 2013 Lexus GX 460 comes standard with antilock brakes, traction and stability control, hill descent control, hill start assist, front- and rear-seat side airbags, driver and front passenger knee airbags and roll-sensing side curtain airbags spanning all three rows. A collision mitigation system is included with the optional adaptive cruise control, and lane-departure and distracted-driver alerts are also optional features. In brake testing, the GX 460 slowed from 60 mph to zero in 127 feet, average for its class. The interior of the GX 460 is upscale and assembled with precision, though the overall opulence factor isn't quite as high as we've come to expect from other Lexus products. The lengthy features list translates into a somewhat busy-looking control panel, but these controls are easy to use thanks to intuitive placement. The gauges are easily read, as is the optional navigation system. The 60/40-split-folding rear seats and power-folding third-row seats help add convenience for most everyday suburban affairs, though we've found the second-row seats are rather hard and flat, and hence not particularly comfortable. Cargo space with both rear rows lowered measures a useful 92 cubic feet. Rather than having a typical liftgate, the GX 460 comes with a swinging rear cargo door hinged on the passenger side. The design complicates curbside loading, though a flip-up rear window allows for the stowing of smaller and lighter packages. Because the 2013 Lexus GX 460 is a body-on-frame SUV, it drives more like a truck than car-based crossovers. Still, the GX manages to impress with a refined, smooth ride and respectable handling. Those who like to take corners more aggressively, however, will notice ample body roll and intervention from the stability control system. The Premium trim's adaptive variable suspension and rear adjustable height control enhance versatility and convenience by allowing the driver to select a stiffer or softer suspension tuning for various conditions. These features also adjust the rear height by more than an inch for added off-road ground clearance and easier cargo loading. Acceleration from the V8 is fine around town, but with about 5,300 pounds to lug around, the GX 460 can feel winded during highway passing maneuvers. The transmission shifts smoothly, though it can occasionally be hesitant to downshift.